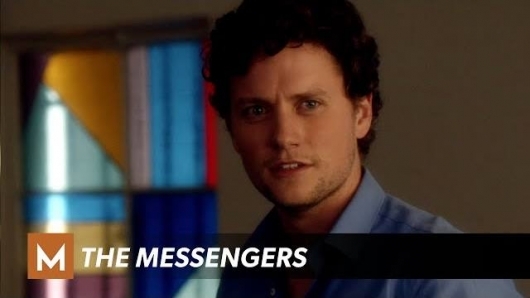 The Messengers 1.2 “Strange Magic” review: They all end up at the hospital, the chapel to be specific. There’s already a bit of chemistry between Raoul and Erin. It wouldn’t be a CW show without the potential of a love connection between gorgeous people. Rose (Anna Diop), who woke up after a 7-year coma, just as Vera was about to smother her as per Satan’s orders, is the glue. Her power is understanding. She reveals that they are the angels of the apocalypse, and freaks them out as she names them and their power. Except Vera. Her power is not revealed yet. They still scatter. Would you believe that crap if you were there? Raul saves Erin from an Amber Alert after reading her and the cop’s mind. They part ways and he finds his brother missing and his niece scared. Peter wanders around hungry and thirsty. Vera and Joshua follow his vision of a one-armed vet who is connected to her missing son somehow. Will Satan get to him first? The scenes kept me interested, especially because they are all running from the law in some fashion or another. I’m still confused as to Satan’s purpose and how things are connected. Rose helps, but I’m still a little confused. It’s only episode 2 though. I remember not liking the first four episodes of The Vampire Diaries thinking it was ho-hum until all of a sudden it turned into a must-see for me. Oh and nice touch – The Last Supper Bar & Grill. The Messengers airs Friday nights at 9pm ET on The CW. THE ANGELS MEET AND DISCOVER THEIR MISSION — Drawn together by destiny, Vera (Shantel VanSanten), Erin (Sofia Black D’Elia), Joshua (Jon Fletcher), Raul (JD Pardo) and Peter (Joel Courtney) convene together where they meet the mysterious Rose (Anna Diop). Rose reveals that they are angels and their mission is to find and stop the Four Horsemen of the Apocalypse from bringing about the Rapture. Meanwhile, The Man’s (Diogo Morgado) real identity is revealed and he continues to tempt Vera with clues about her missing son. Craig Frank also stars. Duane Clark directed the episode written by Trey Callaway and Eoghan O’Donnell (#102). Original airdate 4/24/15. All has yet to be revealed. The Messengers is all new Friday at 9/8c! You can’t escape destiny. Executive Producers Eoghan O’Donnell and Trey Callaway tease what to expect on Friday’s all new TheMessengers! Stop the apocalypse. Save mankind. The Messengers is all new Friday at 9/8c! These “gifts” were given to The Messengers for a reason. Sofia Black D’Elia breaks down her new ability. The Messengers is all new Friday at 9/8c! Temptation will always be a factor. Shantel Van Santen and Diogo Morgado recap the series premiere. The Messengers is all new tonight at 9/8c! Vera will do anything to get Michael back. Shantel VanSanten breaks down her first encounter with The Man. The Messengers is all new Friday at 9/8c!